A group of intense young women standing in lines. Sunlight fills the room but there is no warmth. The reverse shot is of a severe middle aged woman in the black of widows or public executioners. She barks commands that physically divide the group into two according to religious commitment, to the left and right of her. Alone in the centre, the young Emily Dickinson looks fraught. She is grilled briefly by the headmistress but her answers resist the force with boldness, wit and conviction. Her family saves her in the next scene, robbing us of a first act filled with personal rebellion but promising much. Most of the rescue scene is a single shot and is conducted with dialogue. The characters, father, sister, brother and Emily, are lined up like a portrait in oils and there is a tension between the senses that it also feels like a school play. It isn't. It's a Terrence Davies film. That's not a slight. Biopics are difficult. Most of them end up make a quilt of great moments in history to be draped over any attempt to examine the questions a life story should present. Pollock fails because it presumes our reverence and begs our indulgence. Amadeus works because it keeps the theme front and centre and plays as fiction (and was weakened buy the director's cut which put all the "moments" back in). The recent Trumbo begins with the compelling notion of a writer surviving public ostracism by stealth but very quickly changes down to cruise control by rolling out the desk calendar quotes and history bites. So, what do you do when your subject's chief action scenes are conversations or someone scratching away at paper by lamplight? You get someone who can fill a still scene with deep substance. You get a Terrence Davies. Since the mesmerising Distant Voices Still Lives Davies has shown a heavy talent for drawing his audiences into what are often long held tableaux, people looking out at us from the screen, shifting on their feet, uncomfortable in the formal clothes of portraiture as their voices tell us what they are thinking, giving us the weight of the moment. In one of these the mother of the group wishes her husband was there for the picture. When we later see his terrifying violence against her we will remember this. 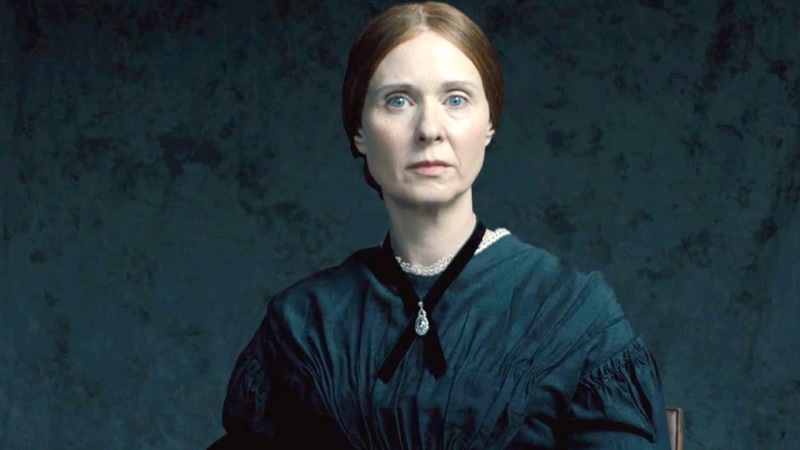 A Quiet Passion doesn't change this pattern much where the dense stillness alternates with scenes of interaction and dialogue that feel like opened windows. There are a few extras this time, though, and they have the odd effect of flaunting the artificiality of some of the wittier dialogue. Some of this plays so tweely you'd think it was an offcut of an old BBC Austen adaptation. That said, I enjoyed the unease of these moments as they worked to add texture to a film that might have collapsed under its own gravity. Also, they are contrasted with comparable later scenes where wit is served as the mark of maturity and experience where a much darker, more severe tone is given. But what Davies does well is done here. A gentle pan across a parlour reveals a pre-electric family at its leisure who are happy enough until the camera stops on the face of the mother by the fire which glistens with tears that fall from a gaze of deep depression. A family portrait session at a local photography studio serves as a time lapse of years as each of the siblings and their parents grow into their age. Emily and her sharp witted friend Vryling trade epigrams in the garden providing supplemental commentary on what they are seeing with snapping fans or umbrellas. The mother at the end of her life is bathed by her daughters as her stroke ravaged face is beyond expression. Emily's own violent seizures at the end of her life remind us of this and the powerlessness of we who watch to help and so we are horrorstruck. Between these moments, none of more note than similar ones in the surrounding houses at the time, we find the poet. Cynthia Nixon recites apt passages from Dickinson's verses throughout the film and there we hear what she's been doing as we've seen her at the table with quill, paper and lamp all that time. The readings are expressive without affectation. Their ease might make a more literal or begging film boring but this is where A Quiet Passion differs from most filmed life stories. But Nixon's readings are like her performance throughout, nuanced and elegant with a placid mask that her life has taught her will stand guard against the vulnerability of constant disappointment or even the terror of mortality. In her thrashing agonies, punishing wit, or the crushing sadness of her imagining of the midnight world of sexuality (where her conjured suitor climbs the steps like the grim reaper) Cynthia Nixon brings shining life to Emily Dickinson, one that we could only guess at from the sole photographic portrait we have of a freckled country girl with haunted eyes in a scratched Daguerreotype. Where a lesser biographical film tries to cram years into hours on screen Terrence Davies gives us the days, long and almost uniform, enhanced by sculpted thoughts and home baked bread. There being so little to report by way of moment we are given something more like moments spent. For an Emily Dickinson there can be no better tribute.